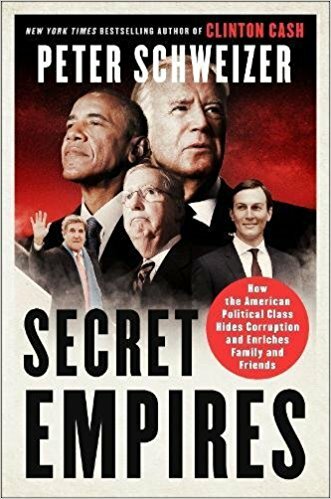 Fred J. Eckert offers a review of Peter Schweizer’s Secret Empires: How the American Political Class Hides Corruption and Enriches Family and Friends in the Washington Times. The astonishing widespread massive corruption of some of the biggest names in American politics that Peter Schweizer reveals in his new blockbuster expose is shocking, startling, stunning — and sickening. “Secret Empires: How the American Political Class Hides Corruption and Enriches Family and Friends” is an insightful and extraordinarily consequential book that should ignite a national uproar. Don’t hold your breath. Our national media can be expected to do all in its power to suppress the possibility of any uproar — even when the corruption is this vast. It’s what they’re best at — covering up their own malfeasance and protecting politicians with whose ideology they’ve allied themselves. One of the biggest scandals in American history was swirling around us. Leading U.S. government figures were embracing corruption. Foreign governments were colluding with American sleazes to hurt our country. Family and friends of these key political figures conspired as middlemen between foreign interests seeking influence and these enormously influential U.S. government officials. Yet not one of the country’s best-known, most-acclaimed, highest-paid members of the major media noticed the corruption occurring right in front of them or else didn’t consider it important. America’s entire news business — the combined resources of major television and radio networks, major newspapers, magazines and wire services — didn’t see it or didn’t care. Aided only by his small team of researchers, this independent investigative journalist with a reputation for fair and honest reporting has provided the American people with clear and compelling proof of widespread corruption at the highest levels of our government involving leading Democrats and leading Republicans alike.